Brooklyn, NY--BAMcafé, a restaurant and live performance venue located within the main Brooklyn Academy of Music (BAM) building, recently installed a QSC Audio KLA Active Line Array Loudspeaker System. 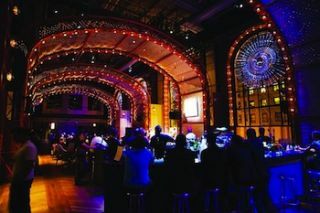 BAMcafé presents as many as 75 music, comedy and spoken word events annually in its free BAMcafé Live series and is open for dinner on nights when there is a performance at the BAM Howard Gilman Opera House. See Factor Industry, Inc., a touring and installed lighting and sound equipment provider was tasked with providing a system which sounds great at a reasonable price point. Such was Wnuk’s confidence in the QSC brand that he recommended the new KLA system sight (and sound) unseen, he said. Originally conceived as BAM’s ballroom and completed in 1908, the room was renovated and renamed the Lepercq Space in honor of the chairman of the board in 1973. BAMcafé opened in the BAM Lepercq Space in 1997 and launched its BAMcafé Live weekend programming two years later. Depending on the room setup, the venue holds between 160 (dinner and dancing) and 325 (standing) people. The KLA12’s are flown above the performance area located at one end of the room, which measures approximately 117 feet by 42 feet, and offer coverage all the way to the bar area, which is 75 feet down the room. BAM, which is currently celebrating its 150th anniversary, is America’s oldest performing arts center, and has hosted wide variety of celebrities, from performers to presidents, during its years of service.